The PokerStars Caribbean Adventure is an annual televised poker tournament. The event was first held in 2004 and was originally co-sponsored by PokerStars and the World Poker Tour. In 2008, the event moved from the WPT to the European Poker Tour. In 2010, the event was moved again and served as the inauagural event of the North American Poker Tour. In 2017 the tournament was the inaugural event of the new PokerStars Championship tour and renamed PokerStars Championship Bahamas. The name was changed back to the PCA for 2018 and the buy-in restored to $10,000. In 2004, the event took place on the Royal Caribbean Voyager of the Seas cruise ship. 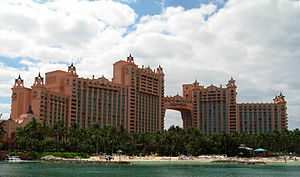 Since 2005 the event has taken place at the Atlantis Casino and Resort on Atlantis Paradise Island. The 2011 PCA commenced on January 4, 2011. Over fifty events took place over ten days, including the main event with an estimated prize pool of $20 million. Players either buy into the main event directly for $10,300, or they may win their way into the event via satellites running on PokerStars and at the event. The main event final table was aired live on ESPN2, featuring commentary by James Hartigan and Daniel Negreanu. John Dibella, a 43-year-old stock trader from New York, won the 2012 PCA for $1,775,000. Dibella won a live $1,000 satellite into the $10,000 Main Event and is the first amateur player to win the tournament. ^ Bartley, Stephen (August 10, 2017). "The PCA is back! PokerStars iconic live event returns in January". PokerStars Blog. Retrieved August 10, 2017. ^ "Caribbean Poker Adventure - 2004 - Day 1". PokerStars. ^ "PokerStars Caribbean Adventure 2005". PokerStars. ^ "Tournament Schedule - Buy-ins and Start Times for PCA 2011". PokerStars. This page was last edited on 31 January 2019, at 07:47 (UTC).